Missing a season due to academic suspension and quitting on his Syracuse team in 2009 allowed the Buccaneers to scoop up wide receiver Mike Williams in the fourth round of the 2010 NFL Draft. 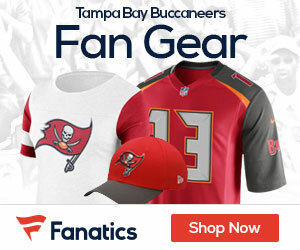 Declared the starter on the first day of training camp by head coach Raheem Morris, Williams led the Buccaneers with 65 receptions for 964 yards and 11 touchdowns, tops among all rookie receivers which made Williams one of five finalists for NFL Rookie of the Year. After proving his doubters wrong in 2010, Williams aims to avoid the dreaded sophomore slump in 2011, Mark Gaughan of The Buffalo News reports. “People said I was going to hit the rookie wall,” Williams said. “I never did. People talk about the sophomore slump. I’m going to run over that too. The only major blemish on his rookie season was a DUI arrest in November, though urinalysis tests determined that Williams was not impaired and the charges were dropped. as i tweeted the other day, i’m going out on a limb and saying by the end of the day, Mike Williams will be better than the greatest receiver to ever play the game..that’s right..i’m saying it..Jerry Rice.